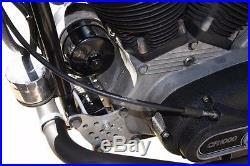 Black Alternator Conversion by V-Twin Manufacturing. Generator alternator conversion kit replaces original generator and regulator. Compact, high output alternator measures 3-1/4 long, and weighs only 3 lbs. Kit includes black alternator and black regulator. Stronger than stock, features billet housing for accurate alignment and a stress proof shaft. Alternators have 5/16 x 24 mount holes for screws. 13T drive gears are for all Big Twins, and 14T is for all Sportsters! NOTE: Black finned Regulator is not built-in and must be mounted remotely. Cannot be used with mini battery (12N55A-3B). 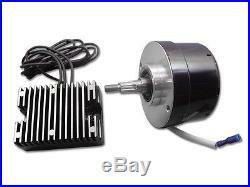 The item "Black Generator Alternator 12 Volt 17 Amp Conversion Kit Harley Ironhead Panhead" is in sale since Friday, June 24, 2016. This item is in the category "eBay Motors\Parts & Accessories\Motorcycle Parts\Electrical & Ignition\Other Electrical & Ignition". The seller is "americanclassicmotors" and is located in Zieglerville, Pennsylvania. This item can be shipped worldwide.